Dean Martin was born Dino Paul Crocetti to an Italian father and Italian-American mother; English was not spoken in his home until Dean was five. He later commemorated his father’s birthplace – the land of Caesars, Galileo and Leonardo da Vinci – in song. The moon may well hit your eye 'like a big pizza pie' in Napoli but this is no preparation for perhaps the most cringeworthy rhyme in popular music history: 'When the stars make you drool like a pasta fazool'. Fazool derives from fasule, the Neapolitan name for fagioli – beans. 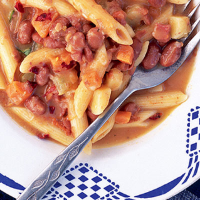 So here's a recipe for a nice pasta e fagioli with which I hope to cajole ye'; I’ve adapted from the dish served at my favourite cantina in Naples – La Chiacchierata. Fry the garlic in 2 tbsp olive oil for about 1 minute until pale gold, then add the pancetta and the fresh vegetables; cook for a few minutes, then add the chilli. Stir well. Add the stock and bring to the boil. Simmer for 5 minutes, then add the pasta and half the beans. Mash the remaining beans and add them with the torn basil leaves. Cook for 10 minutes until the pasta is al dente, then season to taste. Serve in bowls and drizzle with the remaining olive oil. It has to be barbera. Nothing else wakes up pasta and beans quite so vivaciously.